Hiroshige’s Yui (19C ukiyoe or woodblock print). Note the three travellers top left ascending Satta Pass. 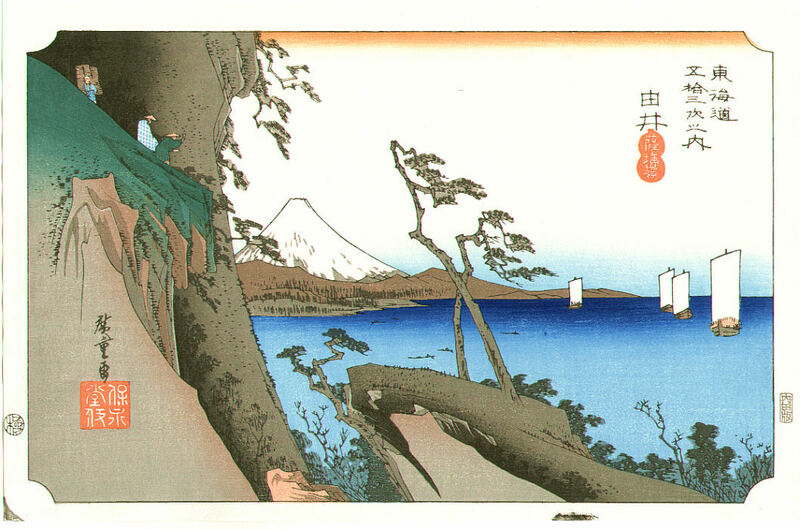 The two customers, presumably travellers from the big city of Edo (now called Tokyo, with a population of 1 million during the Edo Period, 17C~mid 19C) stand in awe of the stunning vista across Suruga Bay (Japan’s deepest bay) to Mt Fuji (Japan’s highest mountain). Their retained guide and luggage carrier over the steep Satta Pass, presumably a local, is however not interested in the view and leans into his work. “Ah, Fuji, seen it a million times”. Travel the 21C equivalent Tokaido Shinkansen at 280km per hour along this same stretch and you will see many locals pull the blinds down to focus on their smartphones. “Ah, Fuji, seen it a million times”. Hiroshige captures the irony that worldwide, we overlook stunning beauty under our noses because of familiarity. Shizuoka City’s Tokaido Hiroshige Museum explains the process of printing ukiyoe and also has some interesting vidoes and displays pointing out some of the ironies and secret messages hidden in many of Hiroshige’s works. The Museum’s main display of original Hiroshige works changes several times a year to suit specific themes. The Museum notes that Hiroshige, originally a firefighter in Edo, benefitted from an early-mid 19C travel boom when he published his first printed work – the 53 Stages of Tokaido. Hiroshige went on to influence Impressionists Claude Monet and Van Goh with his style. Until Hiroshige, landscapes were not popular in Japanese art, which focussed on portraits where the landscape simply provided background. Ukiyoe is also the origin of today’s globally popular Manga culture. Hiroshige’s scenes are based on real life experiences, but he is happy to modify the details, including colour shades, people, and even where Mt Fuji is positioned, with his publishing team back in his Edo studio to deliver ironic messages and an overall interesting series.